The GFF process has changed the nature of the dialogue between the Ministries of Health and Finance. The DRC investment case focuses on the scale-up of quality reproductive, maternal, newborn, child and adolescent health and nutrition services, with a special focus on nutrition and family planning as well as health system strengthening. The government is prioritizing the 14 provinces with the worst health and socioeconomic indicators. Results to date are showing an increase in use of new curative service from .25 per capita to .32 per capita. The quality scorecard, which is based on 150 indicators, improved from 25% to 49% after nine months of implementation. 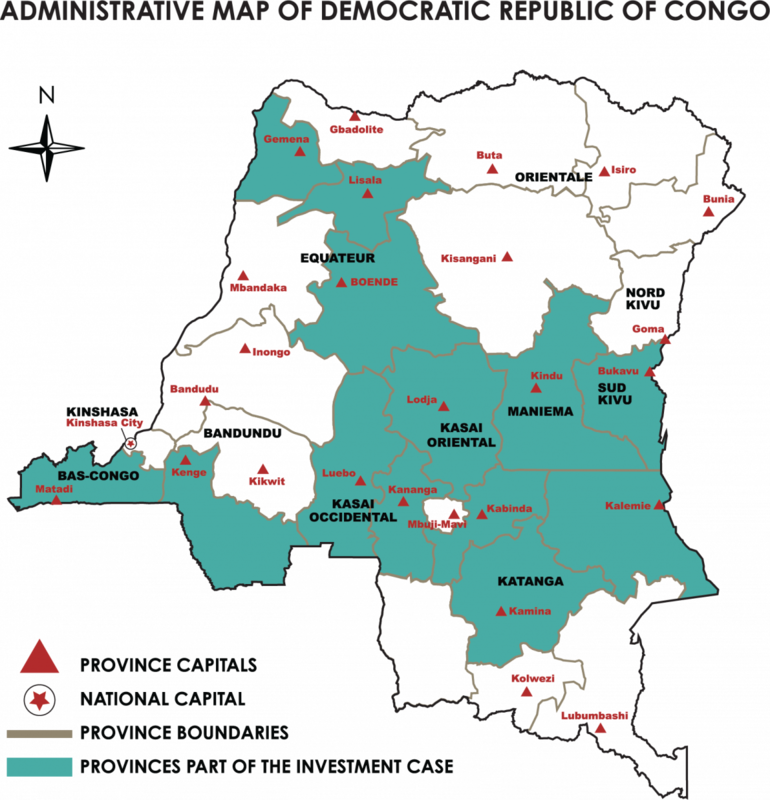 DRC has some of the highest maternal and child mortality ratios in the world, and chronic malnutrition. Households bear 40% of total health expenditures and public spending on health is inefficiently allocated. At 846 deaths per 100,000 live births in 2014, Democratic Republic of Congo has one of the highest maternal mortality ratios in the world. Women have an average of 6.6 children, and 42 percent of women in the poorest wealth quintiles, aged 15-19 years, are mothers or pregnant with their first child. The contraceptive prevalence rate is 8 percent and population growth is 3 percent. For every 1,000 children born, 58 die before their first birthday and 105 die within the first five years of life. Chronic malnutrition affects 43 percent of children under five, one of the worst rates in the world. These poor health outcomes are linked to low levels of effective coverage of high-impact reproductive, maternal, newborn, child and adolescent health (RMNCAH) services, particularly low quality antenatal and delivery care and low capacity for emergency obstetric care. In 2015, per capita health spending was US$ 22 in the Democratic Republic of Congo, one-sixth of the average in Sub-Saharan Africa and one-fourth of the amount necessary to provide basic health services to the population (McIntryre and Meheus, 2014). Households bear 40 percentof total health expenditures, 93 percent of which is made of out-of-pocket expenditures while donors are another key driver of total health expenditures, funding 40 percent of it. Public health spending is only 12 percent of the total health expenditure and is inefficiently allocated to population health needs. The GFF was launched in April 2015 after which the Government of the Democratic Republic of Congo put in place a GFF platform that grouped together health stakeholders as well as other line ministries, representatives from civil society, and technical and financial partners. The GFF platform took the lead in developing the country’s investment case which prioritizes even further the interventions laid out in the National Strategic Development Plan 2016-2020. The Ministry of Health, with representatives from the civil society, focused on defining RMNCAH priorities; UNICEF conducted a health system bottleneck analysis; the World Health Organization provided support in costing the investment framework; and the GFF secretariat helped with the resource mapping exercise. In the future, the GFF platform will be tasked to monitor the implementation of the investment casein the 14 prioritized provinces. indicators as key targeted regions to align and harmonize domestic and external support. Engage with the private sector as a key actor for improving system performance and achieve results. mortality by an average of 17 percent1. Currently, the government, the private sector and technical and financial partners cover 68 percent of the investment framework’s budget, representing 1,801,228,420 US$ over five years (8,94 US$ per capita per year). This implies a financial need of 32 percent, representing US$844 million over five years (US$4,14 per capita per year) for the 14 provinces prioritized in the investment case. 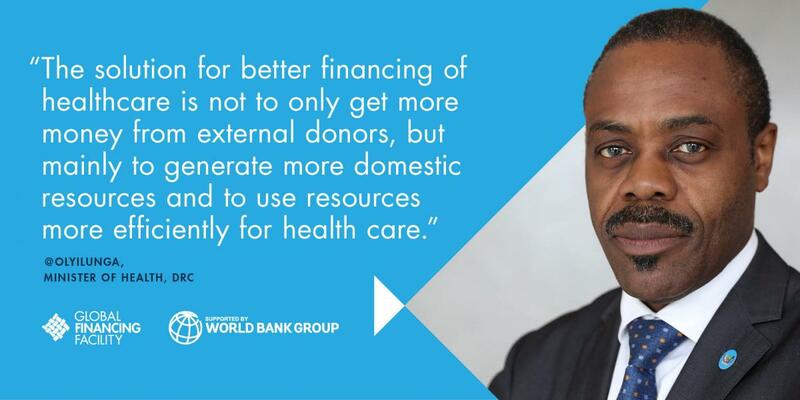 increase financial protection, the health financing strategy underscores the need to reduce fragmentation in the health insurance system by pooling health insurance mechanisms from the private and public sector, subsidizing the poor, and expanding community-based health insurance to target the informal sector. Efficiency is at the core of the investment framework in the Democratic Republic of Congo, which focuses on resource pooling at the provincial level by expanding its experience with the Contrat Unique (single contract). The objective of this reform, at the decentralized level, is to have one budgeted plan of activities in the provincial health administration that is financed through the pooling of domestic and external funds. This reform addresses fragmentation in funding and service delivery—a major driver of inefficiencies—with the aim of strengthening planningand reducing administrative and management costs. The single contract puts in place a performance framework to assess the performance of the provincial health directorate. Although the single contract was created before GFF, it is being scaled up as part of the investment framework. Along with this single contract, several reforms, such as those aimed at reducing the number of parallel supply chains delivering drugs to the same facility and decentralizing human resource management, are under implementation. The GFF process has changed the nature of the dialogue between the Ministries of Health and Finance, moving from a focus on clinical issues and disease burden to a focus on results and returns on investments for health. The investment case concentrates on scaling-up quality RMNCAH-N services with an emphasis on nutrition, family planning and health system strengthening.